This Fun Family Games Blog updates with each new game that we add. check here for a fun printable game. Our Printable Games Listed by Category for your Convenience. Continue reading "Visitor Site Map for Printable Games"
Fun Family games has printable games, word puzzles, mazes, coloring pages, printable trivia games, learning games, online games and family fun game ideas for kids and adults. Continue reading "Fun Family games has many fun printable games for family night fun." Trivia Night Fun covers 6 different categories, fun for all. Continue reading "Trivia Night Fun covers 6 different categories, fun for all." Superheroes trivia explores the protectors of all things Good from their archenemy villians. Continue reading "Superheroes trivia, the protectors of Good from Evil villians." Country music trivia covers past decades of favorites, singers and songs, as well as todays artists and songs, from Patsy Cline to Faith Hill. Continue reading "Our country music trivia covers past years and also todays favorites"
Holiday Games are handy to have when you are entertaining. When you are stumped for unique Holiday Games, you will find that printable games are the fastest, easiest, and the best selections to choose from. You just personalize, and print as many as you need. Continue reading "Holiday Games are handy to have when you are entertaining." Continue reading "July 4th trivia is a fun reminder of our independence and rights"
Easter trivia covers a holiday that has been around for centuries and crosses many cultures. 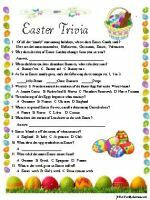 Continue reading "Easter trivia and facts is more than bunnies and eggs "
With these Bible trivia games, our goal is to inspire and encourage our visitors, in their Bible research and study. Continue reading "Bible Trivia II covers many areas, from cover to cover." These Bible Games are for anyone that has general knowledge of the Bible. Our Bible Games covers a wide spectrum of people, places, events and general knowledge of what is between the pages of Genesis and Revelation. Continue reading "These Bible Games are for anyone that has general knowledge of the Bible." Genesis and Daniel Trivia Quiz, creation, lions den, and more. Our Genesis and Daniel quiz covers two important books of the Bible. The full account of creation and stories of the Jewish nation. Continue reading "Genesis and Daniel Trivia Quiz, creation, lions den, and more." These kids party games are all party favorites, for any event. These new kids party games are favorites of all age groups. They will keep the party going. Continue reading "These kids party games are all party favorites, for any event." Our Food Trivia game also includes a Fast Food Trivia game. Food Trivia and Fast Food Trivia, what you eat and where you eat it. 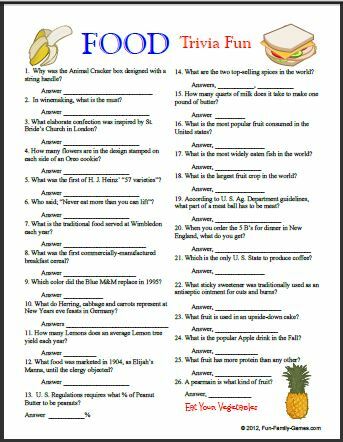 Continue reading "Our Food Trivia game also includes a Fast Food Trivia game." The women of the bible quiz covers just some of the many names. When you start to study the women in the bible you will find that there are many more names than you what you grew up learning about. Continue reading "The women of the bible quiz covers just some of the many names." Our Oscars trivia game focuses on the winning Actors and Actresses of 31 movies from 1960 to the present. Continue reading "Oscars trivia game focuses on Oscar winning Actors and Actresses"